Well-designed and full of visual examples, Inkwell provides detailed planning and supporting material (including recorded songs). 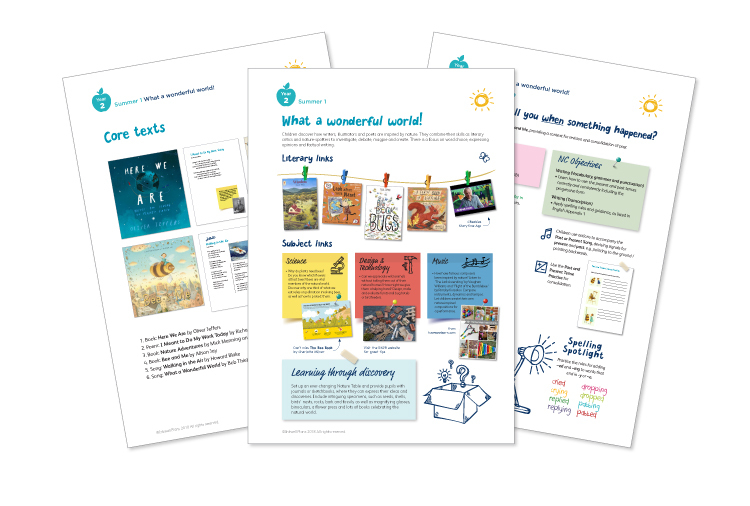 User-friendly, we are the go-to resource for busy teachers who don’t have time to wade through overcrowded planning grids or trawl the internet for the perfect English lesson. Inkwell has an easy to follow layout that can be tailored to your class, and offers guidance for differentiation. We promote a whole school culture that fosters a love of reading, storytelling, writing, drama and poetry. Classes are given opportunities to share and celebrate their learning across year groups. Guess What Happened At School Today? Exploring school life through books is an ideal way to discuss attitudes and expectations for reading and writing with your class. Children personalise their responses to fiction and non-fiction texts, through their Reading Journals, and have plenty of opportunities to try out new vocabulary and test their stamina through a range of writing tasks. Children become fairy tale experts, exploring the common themes and characters found in traditional stories. There is a focus on reading comprehension (inferences), sentence types (statements, questions, commands and exclamations), as well as homophones. What to pack, where to go, how to get there and all the things that happen on the way – the theme of travel is explored using film, classic literature, poetry, picture books and atlases. There is an emphasis on shared reading and using grammar in context (nouns, adjectives and verbs). How do we communicate? It’s not only through language. Gestures, codes, music and imagery are explored as tools for conveying messages. There is a focus on using punctuation effectively, joining ideas with conjunctions, and understanding adverbs. Children discover how writers, illustrators and poets are inspired by nature. They combine their skills as literary critics and nature-spotters to investigate, debate, magpie and create. There is a focus on word choice, expressing opinions and factual writing. understanding the journey of a story from sketchy ideas to publication.